2015 Volkswagen Eos reviews say the combination of a real backseat and a retractable metal top is what makes the Eos such an interesting choice. The Eos is one of the least expensive hardtop convertibles on the market and the only one with a sunroof. First introduced in 2006, the Volkswagen Eos rides on a modified version of the Golf's platform, but has unique body panels that make the car a stand-out. When the top is up on the Eos, it looks like a sporty coupe. The solid top also provides a kind of quiet that is unmatched by ragtops and is more practical for winter months. 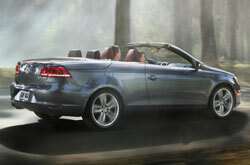 With the top down, the Eos has one of the most distinctive, streamlined designs on the road. 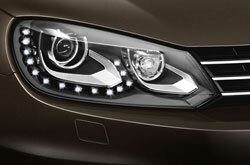 Optional accents like the rear spoiler and bi-xenon headlights accentuate the slim grille to give the Eos a distinguished and continental persona. Slide behind the wheel of a 2015 Volkswagen Eos in Orlando. Inside, the Eos is appointed much like a luxury car, with nicer materials than you'll find in many other models. This front-wheel-drive coupe is powered by a 200 horsepower 2.0-liter turbocharged four-cylinder engine delivering 207 pound-feet of torque. A six-speed automated manual transmission provides the convenience of a conventional automatic transmission while providing the option of manual shift control to drivers who want it. Nicely equipped, the Eos comes standard with antilock disc brakes, traction and stability control, pop-up rollover bars and front side airbags that extend upward for head protection. All Eos models get VW's Car-Net telematics system, which includes automatic crash notification, roadside assistance, remote vehicle access, stolen vehicle location and geo-fencing. VW's Car-Net smartphone app lets owners control many of these functions on the fly. 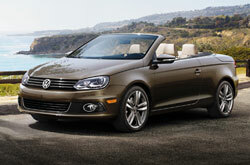 Volkswagen built the new Eos with standard and optional safety features that set it apart from competing convertibles. The Eos is beautiful outside and comfortable inside, showing Volkswagen has given drivers of their high-class convertible some of the best standard and optional amenities. 2015 Volkswagen Eos reviews agree its attractive interior design, first-rate materials and luxury-caliber build quality, strong engine, refined ride and abundant technology features make the Eos worth consideration for convertible coupe shoppers. See the 2015 Volkswagen Eos in Orlando at David Maus VW South. We're absolutely sure that the Eos is an ideal fit for you. That's why we have the courage to ask you to compare Volkswagen's newest model next to the 2015 Infiniti Q60, Chrysler 200 and the Acura ILX. With passenger-oriented cabin features and an splendid design, shoppers will love the Eos. When comparing its price to the aforestated list of vehicles you will easily see that Orlando Volkswagen customers select it because it's a remarkable value. Look through the Eos bullet list below for more quick facts. Buying a car takes persistance, research and a little help along the way! That's why David Maus VW South has provided the Eos review above and reviews of other 2015 Volkswagen models. We're a respected car dealership in Orlando for a reason, part of which is that we provide reviews composed by experienced writers who are at the height of their craft. The above article is jammed with practical information - it contains info about cabin features and other specs so that you can make smart decisions about the Volkswagen you want to buy. Is the Eos not the right pick for you? Discover more about other vehicles offered by David Maus VW South using our reviews index. 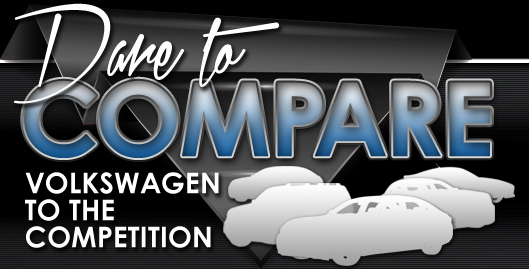 With it you can review and compare Volkswagen's entire line of vehicles.